Whether you have a budding mixologist in the family or you want the perfect gift for your cocktail-loving friends, it’s easier than you might think to set them up with a home bar on par with the pros. Great drinks start with a set of great tools and those can all be found at The Boston Shaker, where bartenders in-the-know go for their most trusted accessories. The cozy store, located on the edge of Somerville’s Davis Square, boasts an impressive array of “field tested” equipment, unique mixers, recipe books and the nation’s largest collection of cocktail bitters. Store manager Lonnie Newburn is happy to geek out over the finer points of cocktail making, offering a few key tips for those new to the shake and stir hustle. Newburn preaches the gospel of quality spirits, fresh ingredients, and measuring, and he always loves sharing his tips whether with customers coming in the door or through classes at The Shaker. “This is THE bar tool,” Newburn says. 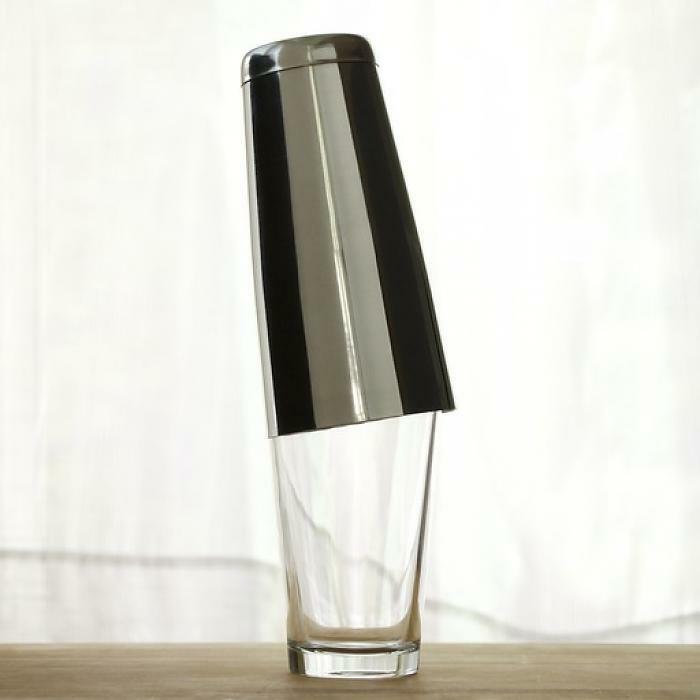 The shaker consists of two parts. First, the 16oz glass base, aka a pint glass. Add your ingredients and ice in there. The transparent container helps you see what you’re doing and makes it a lot cooler for your friends to watch you work. The top of the shaker is a 28oz tin, used for vigorous shaking. Cap this puppy on tight and give your drink the business. Purchase here. Now that you’ve mixed your drink, you want to either pour it over fresh ice or “up” in a chilled glass. The Hawthorne strainer is the perfect tool for this. Looking like a cross between a magnifying glass and a Slinky, it fits snuggly over your shaker tin. 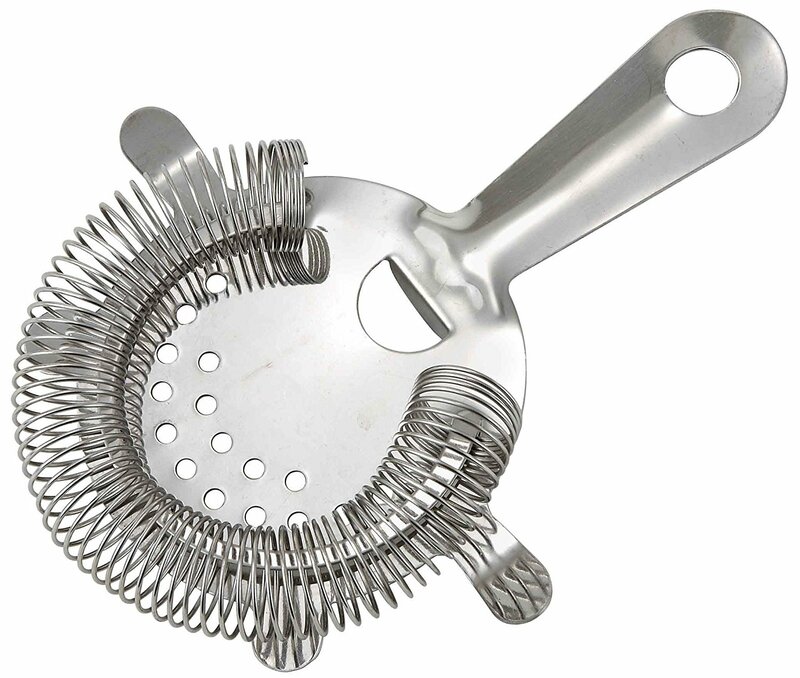 “The coil helps filter out ice chips, fruit pulp, herbs or even egg shells,” says Newburn. Grab yours here. The key to making consistently balanced cocktails for you and yours is to always measure. It may not be the coolest part of the job, but it’s super important. There are two types of jigger to help you with this. 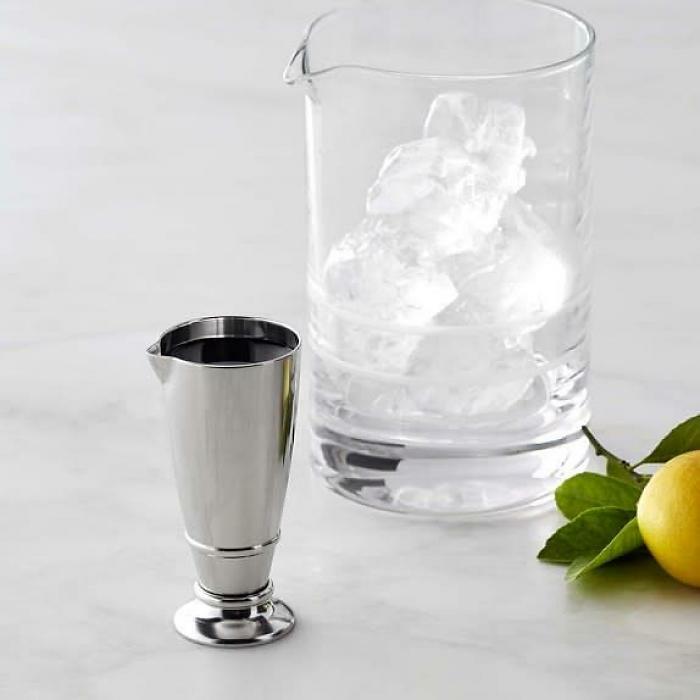 The traditional, hourglass shaped double jigger that measures between a half and two ounces, and the popular mini-measuring glass which fits a full three ounces of liquid and looks adorable. See options here. Some cocktails don’t call for a shake. Drinks comprised entirely of spirits (think martinis and Manhattans) require the gentle incorporation created by a swiftly rotated and swirled bar spoon. Again, there are a variety of sizes and styles when it comes to the bar spoon. “Like a chef’s knife, the length of the barrel, bowl size and tip design are subject to the user’s preference,” Newburn says. In other words, make sure to find something that fits comfortably in your hand. Find bar spoons, galore. 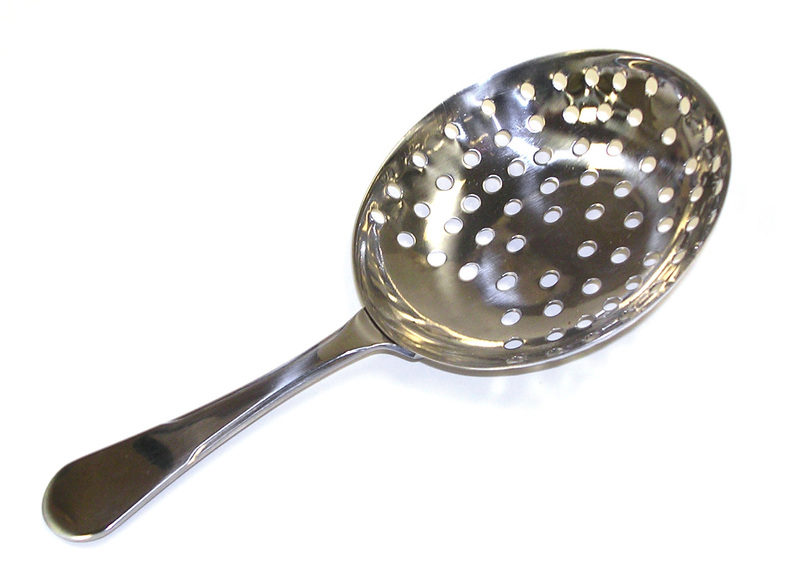 The Julep strainer is the streamlined cousin of the Hawthorne. Technically, it’s a really big slotted spoon used for straining drinks from your shaker tin. The Julep strainer is used for drinks that have been stirred and thus have fewer bothersome chunks to keep out of your drink. 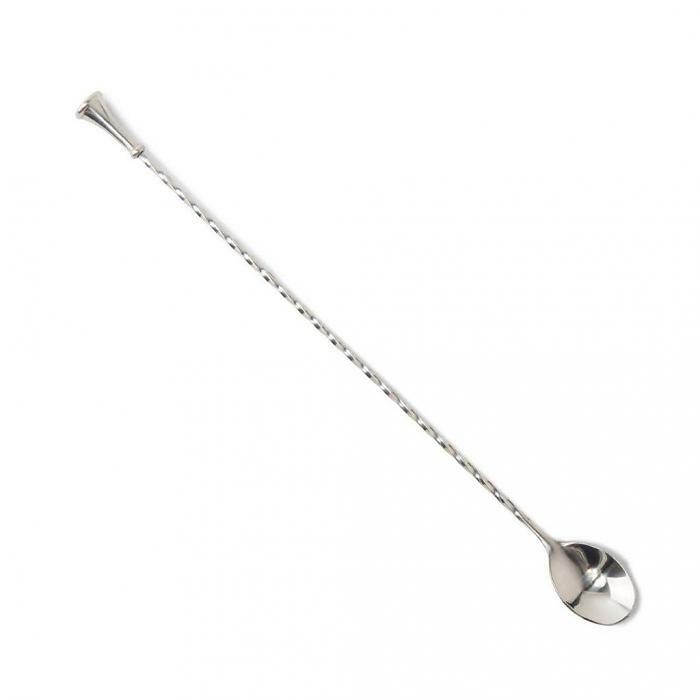 “But,” Newburn says, “it can be used as an ice scoop in a pinch.” Discover this versatile tool. And there you have it. The five essential items to get you started on the home bar of your dreams. Costs vary by brand and style but will run you between $60 and $100 for the entire kit. Happy shaking!